Sandy was confused about a recent hexagon post that I wrote. She asked “OK–you said sewing in a circle. What order do you do the seams, then? Sew piece 1 (center hexie) to piece 2, then piece 1 (center) to piece 3, then adjoining seams of 2 and 3? My response, slightly edited for clarity, was: If I understand what you mean, remember that the goal is to have no hexagon edges raw. 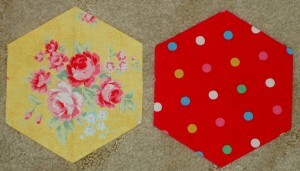 This means that each side of the hexagon will be sewn to another side of another hexagon. This may be different on the edge of the quilt, depending on what the designer (you!) 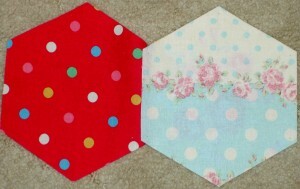 decides to do about borders, but for the middle, you want each hexagon edge to be sewn to another hexagon edge. Remember: no sewing into the seam allowances! I am going to show you how to do this with 3 hexagons to start. Go get 3 hexagons, I’ll wait. Put them on your design wall or on your floor and gaze at them. See the V formed by the top of the 2 bottom hexagons? Pay attention to that. You will need it later. First, you sew two sides together. These will be two separate hexagons that you have already marked. Remember, you can mark with the Jinny Beyer Perfect Piecer and a Sewline pencil or with your favorite ruler and marking tools. Put the first 2 hexagons right sides together and sew between the marks. Don’t sew into the seam allowance. If you did sew into the seam allowance, rip out the stitches outside of the marks. When you open those pieces you will have 2 hexagons sewn together. YAY! Second, for the third piece, you have to do a Y seam eventually (hope I explained clearly enough in the post how to do it). Remember that I told you to pay attention to the V? 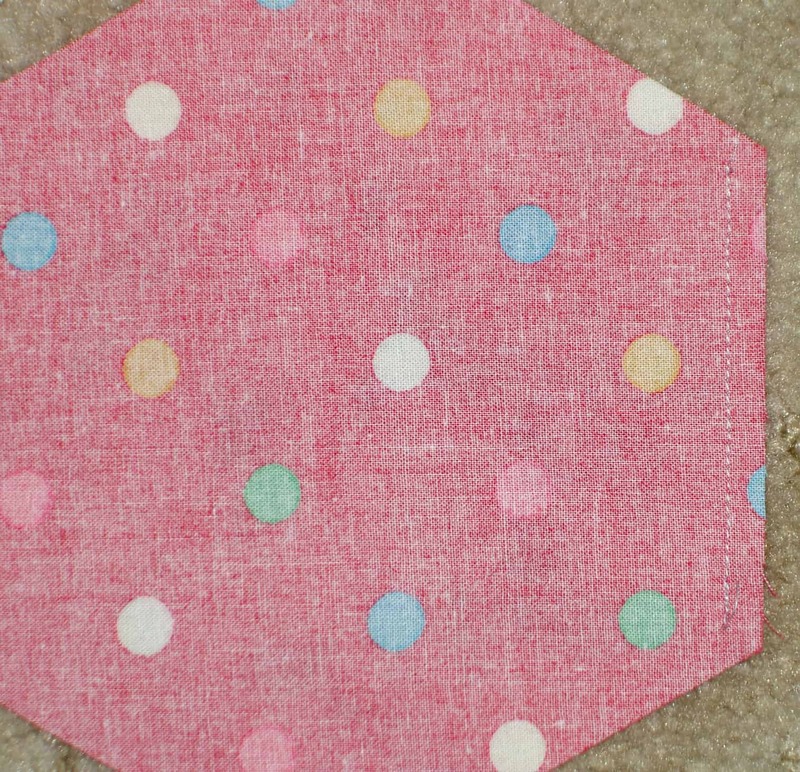 There will be a V where the two already sewn hexagons meet and that is where you will place the 3rd hexagon. You will need to sew 3 seams total to completely add the third piece to the first 2 already sewn pieces. Third, you line up the third piece with piece 1, right sides together, so that one side of piece three will be sewn to one side of piece 1. The side of piece one to which you sew should be one part of the V referenced above. Fourth, once you have sewn one side of piece three to one side of piece one, you fold the neighboring side on piece three right sides together to the adjacent side of piece two. You will fold it on to the other side of the V.
Fifth, sew the second side of piece three to the second side of piece two. Now you have 3 hexagons sewn together. AND you did a Y seam. That wasn’t scary, was it? Sixth, press from the back so all of the seams twirl in the same direction. In terms of keeping track of the pieces, because you want to sew them in a certain order, you need to lay the pieces out and look at them as you sew. I understand that many people don’t have a design wall. A design floor works just as well. 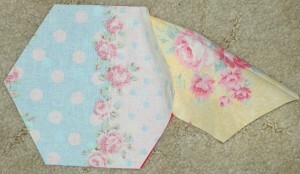 You may need to pin your pieces together in the order you will sew them and take lots of photos. I also have pinned numbers to my patches or blocks so I know what order to sew in. Let me know if you have further questions about the hexagons. This is not a scary process. Just slow down a bit, follow the directions and you will be fine. You can do it! 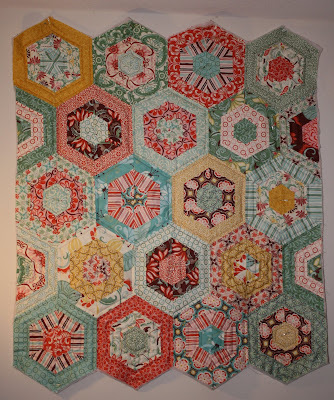 Pam’s recent podcast about her hexagon project is posted on her site. she is very funny in calling this a Point and Laugh-a-long, which makes me laugh. Sandy also posted a much more helpful and informative post that had actual content about how to do the project (not that Pam’s post was not helpful or informative, because it was) rather than just blathering on about process, which is what I tend to do. 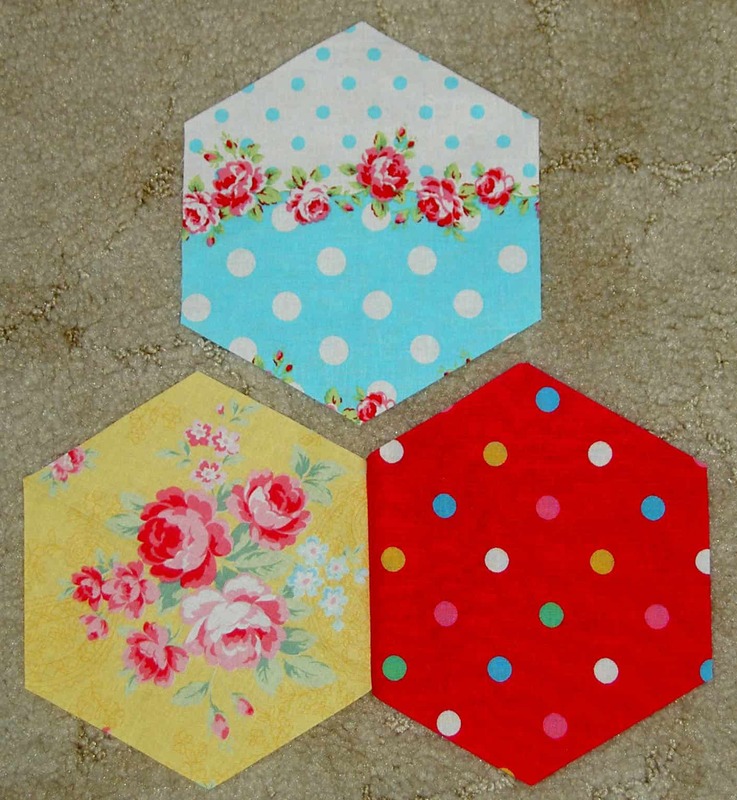 In Sandy’s most recent podcast she talks about the practical aspects of cutting hexagons and how she had success on the Kaye Wood method. 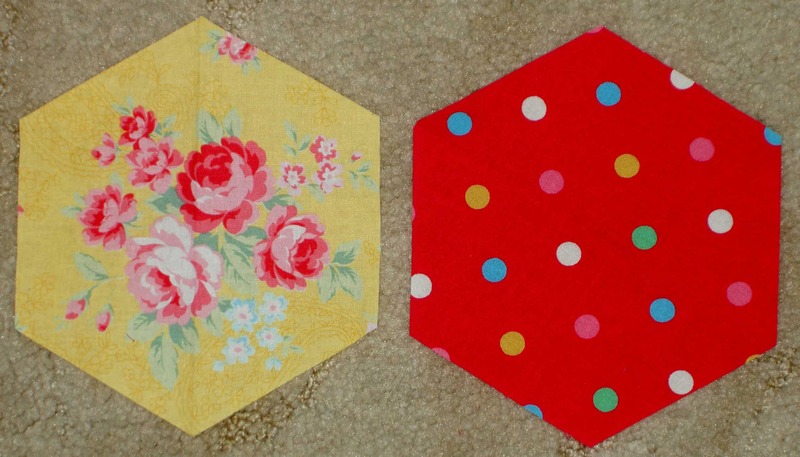 Here are a couple of different takes on hexagon quilts. This one from Random Thoughts do or di won’t work with the method we are using unless you figure out how to put the sashing in between the hexies. if you do figure that out, then you can use the directions all of us have posted to put the piece together. I don’t know if the sashing is more complicated than sewing a strip around the outside. This is a question I would ask TFQ about. This photo from Sunset Sewing is a really nice variation of a hexagon quilt. I can’t tell whether it is a variation of the Spiderweb pattern. 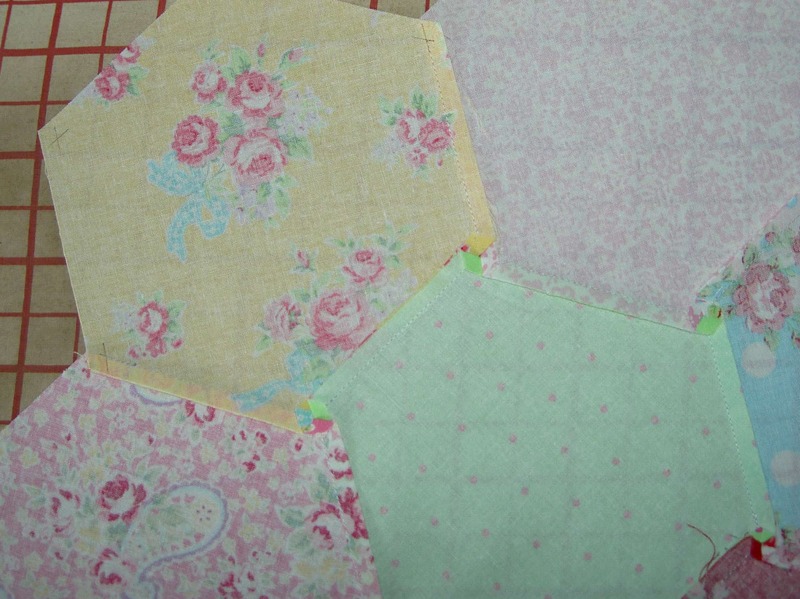 I am sure I will do another hexagon quilt someday. (If I live long enough to finish the first one!) 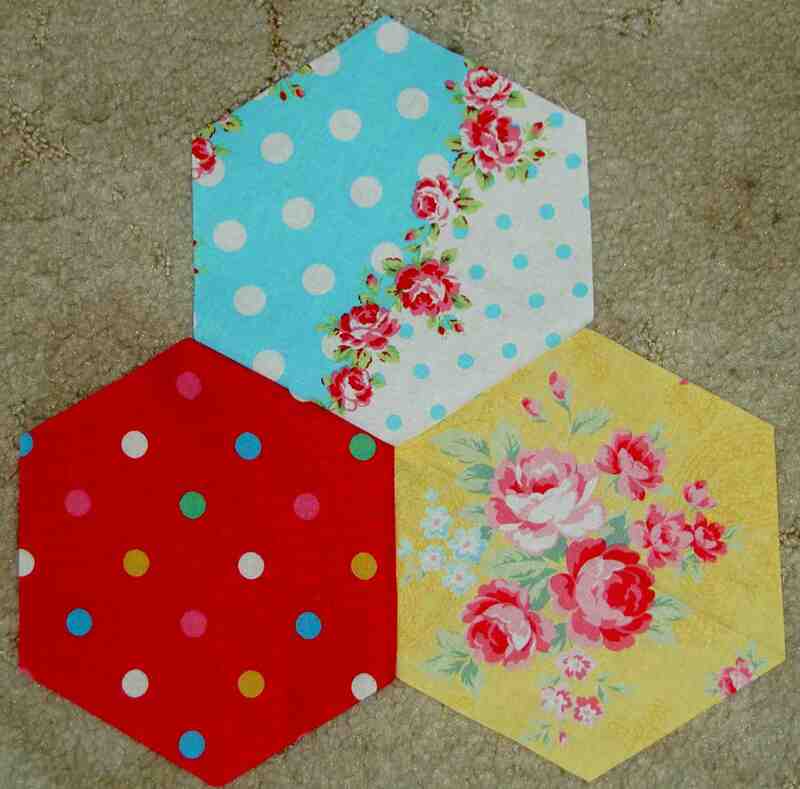 And I want to make the bigger hexagons as I think they would be more rewarding to the more impatient quilters, such as myself! That and the smaller ones I make are very difficult to sew through as often there is three layers of fabric and one of batting to hand sew through, as the seams are in the way of the design I am quilting. If I do another hexagon quilt I plan to quilt it with straight lines that give kind of a snowflake effect, rather than going around and around either on the seams or inside the seams. I think the larger hexagons lend themselves to the larger prints that are popular today, too. When you say there are a number of layers to sew through, do you mean to attach the hexagons to each other or to quilt through? Did I ever answer you Jaye? 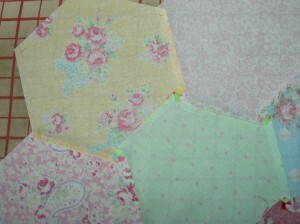 If not, I meant when quilting the hexagons. In my case, sometimes I go through four layers…the backing, the batting, the top of the hexagon AND the seam allowance underneath. 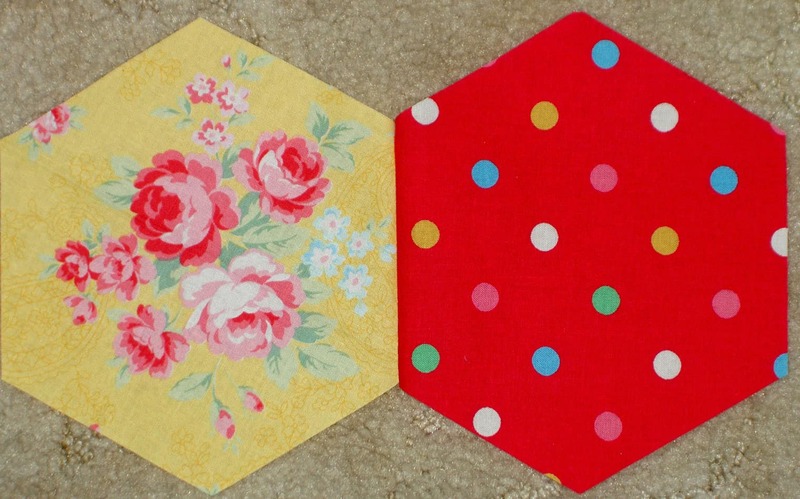 I am quilting a quarter inch inside each hexagon. Since my hexes are about an inch or so in size, that gets very tedious! Gotcha! I quilted circles in the one hexagon block I made AND quilted. I don’t know what I will do for the larger hexagon piece.